The features and layout of The Phoenician property of Starwood Hotels and Resorts at Scottsdale, Arizona, are shown in the following figure. Starwood Hotels and Resorts is no stranger to process improvement. In fact, the president's letter in a recent annual report stated that through"• • • benchmarking, Six Sigma, and recognition of excellence, [Starwood is] driving results in a virtual cycle of self-improvement at all levels of the Company." Recognizing that Improved processes In one department of a single hotel, If rolled out across the organization, could lead to significant improvements, the company recently created a program called Power of Innovation, or POI. The Power of Innovation program in Starwood seeks to capture best practices that exist throughout hotels across all brands in North America. An internal team with expertise in kitchen preparation and production, laundry, stewarding, front office, and housekeeping works with individual properties to build upon and maximize the existing knowledge of local property management teams. The team usually spends about a week on property entrenched in operations to really see day-to-day activity over an extended period. Of particular interest is scheduling the workforce to meet the demand of each hotel's Individual operations while streamlining operations processes. At the Westin Galleria-Oaks in Houston, Texas, for example. the POI team helped management achieve a 6 percent productivity Improvement in the kitchen preparation and product job, with a reduction of 2,404 hours used and $23,320 In annual payroll savings alone. At the same time/ other POI projects at the hotel generated an additional $14A00 in annual payroll savings. The Phoenician in Scottsdale also had a visit from the POI team. One area the team focused on was stewarding. 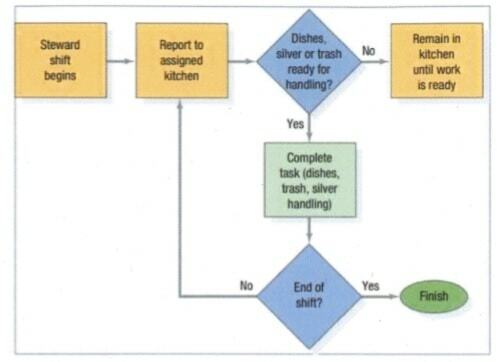 The typical stewardnig process includes the following duties: dishwashing, kitchen trash removal polishing silver, and assisting with banquet meal food prep lines. Stewards support eight kitchens and two bakeries and work with housekeeping In keeping public areas, such as restrooms and pool cabanas, clean. A flowchart that diagrams the existing stewarding process that the team documented is shown in the figure. In any given day. a particular steward may provide support to more than one kitchen and be called upon to do a variety of tasks. Before the POI team arrived, stewards were dedicated to a particular kitchen or area during their shift. Each kitchen required stewarding coverage as outlined by the executive chef, so more than one steward may be assigned to an area. A certain amount of stewarding work could be forecast by tile food and beverage manager, based on scheduled banquets, afternoon teas, conference buffets, and restaurant reservations. Considerable uncertainty also arose from traffic generated by leisure travelers and local clientele, meaning that stewards assigned to designated areas periodically did not have a steady flow of work. On a weekly basis. activity levels for the dedicated stewarding staff were determined, based on executive chef input Other factors considered in the weekly planning Included prior year activity, special events and holidays, and number of children. With this information, the executive steward created a summary of all meals, called covers, by location, date, and time of day. Then an Excel spreadsheet template was used to create the schedule for deployment of stewarding staff throughout the resort's kitchens and restaurants. In performing its analysis, the POI team examined staff availability, banquet events, restaurants, occupied room counts, and other drivers of business to areas supported by stewards. Time studies were done to determine how far stewards were traveling throughout the property, and how long it took to perform each stewarding task. Some restaurants and kitchens did not require full-time coverage by a steward, so the steward would be assigned multiple kitchens to fill a work shift. In the case of coverage between the 19th Hole restaurant on one side of the resort and the Canyon Building on the other side, that steward would walk one-half mile, one way, to take care of duties in both locations because they lacked enough work for a dedicated steward in each location. Often, stewards had downtime as they waited for banquet dishes to be cleared, or kitchen pots and utensils to be brought in for cleaning. Some restaurants had china with special cleaning requirements, meaning those dishes had to be handwashed instead of being placed in an automated sanitizing dishwasher. This situation required a dedicated steward to perform that task. Time studies revealed how long it took stewards to move from one kitchen to the next. The studies also helped the POI team understand how long it took_ to wash dishes In the five-star restaurant versus the casual poolside dining area's kitchen. Additionally, the studies uncovered building design and landscaping limitations that prevented staff from moving between kitchens quickly. In some cases, a maze of corridors added miles to the distances covered each day, and thick privacy hedges barred entry .to sidewalk shortcuts. How can the management specifically improve the stewarding process? Using the information provided, create a flowchart illustrating the new process. Develop a root cause analysis for the process issue faced at the Starvood. How did the change take place in the organisation with POI programme? How do you see the given change in terms of Organisational Development, Total Quality Management OR Business Process Reengineering? Do you think benchmarking will help in this case? If yes, how? What type of Benchmarking do you propose for the new process?